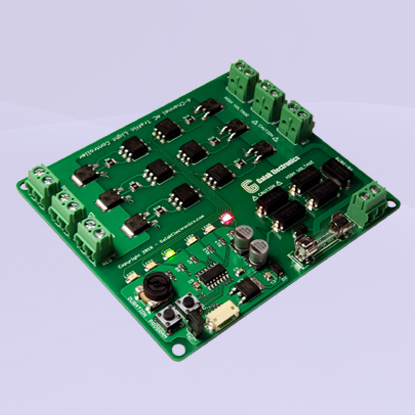 NEWLY improved with the latest in solid state technology, our 6-Channel Traffic Light Controller will power all your traffic light needs. Accepting standard 120VAC line voltage (240VAC available), this controller provides over 500 Watts of power per channel and will drive full-sized LED and incandescent traffic lights (This includes all household bulbs). Solid state outputs also means both inductive and non-inductive loads can be switched effortlessly for years. Realistic features include flashing "don't walk" signal in crosswalk mode and two different arrow sequencing modes and are easily selected with the push of a button. The unit comes with quick installation instructions and four (4) adhesive standoffs for effortless mounting on virtually any surface. Select Accessories above to add a power cord. Four modes: full intersection, traffic light with crosswalk, traffic light with arrows (See chart below). Separate digital control for "YELLOW" allowing for more realistic operation (1 to 8 seconds). User selectable time delay from 5 seconds to 120 seconds (per RED or GREEN light).